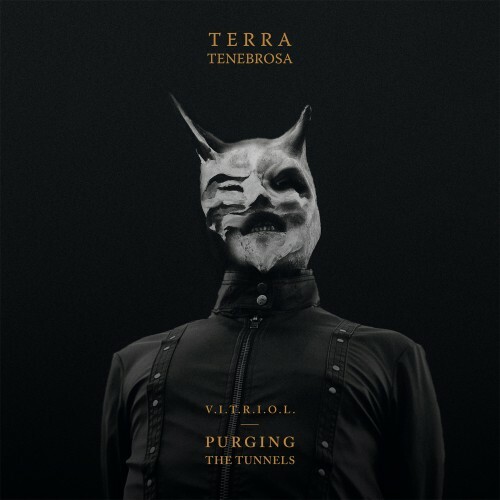 Terra Tenebrosa is a strange beast in the land of Post Metal and Avantgarde. The two releases The Tunnels and The Purging are underground secrets only discovered by a few. From the recording sessions two songs were left and those end the theme of V.I.T.R.I.O.L. Purging the Tunnels. Mainman The Cuckoo shows us again two crawling songs with a sinister vibe. Side A is de 17+ minute song ‘Draining the Well’. The first part is typical Terra Tenebrosa with ominous vocals and slow rhythmic guitar sounds until it continues in a dark ambient part with noise/industrial fragments woven into it. The dark end has demonic vocals, repeating drums and guitar riffs with a Black Metal atmosphere and is strangling you slowly as python does with his prey. Sid Be ‘Apokatastasis’ is only 7 minutes long and reveals the background of the previous band Breach. The riffs and drum patterns are similar but this is combined with children voices in the back and echoing men growls. Again the repeating mood is shivering your back. The music is haunting you and waiting for a surprising, unwanted attack that never happens. Like a predator who is crawling under your bed in your worst nightmare. When the record is over you’ll awake and you are happy to be safe. The vinyl is pressed on 500 copies and released in conjunction with their European tour in April that also brings them to the Roadburn festival. It’s Terra Tenebrosa’s first tour so take your chance to see them live and pick up this vinyl together with the two previous albums (if you haven’t done it already).